Accumulation of 368 used higher value commemoratives from 1983 to 2001 including many top values from 80¢ to $1.00. Good range with some duplication. Odd fault. 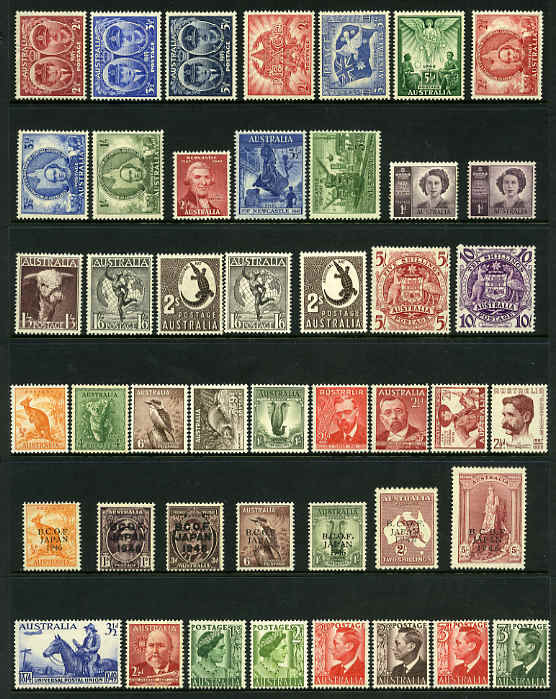 Collection of hundreds of mint Pre-Decimal stamps from 1913 to 1965 including numerous duplicates and a small range of Kangaroo and KGV issues on Hagner sheets. Noted 1927 4½d Violet Small Mult Wmk perf 14 KGV MLH, 1932 4d Olive Small Mult Wmk perf 13½ KGV O/P OS MLH, 1932 5d Brown C of A Wmk KGV MUH, 1914 6d Claret Kooka MLH, 1929 1½d WA Centenary imprint block of 8 with Re-entry to swan's neck and "TR" of "Australia" MLH (2), 1931 6d Brown Airmail MLH (2), 1931 6d Brown Airmail O/P OS MUH, 1932 2d and 3d Sydney Bridge O/P OS set MLH/MUH (5), 1932 1/- Lyrebird MLH (3), 1934 Perf 10½ and 11½ Vic Centenary sets MLH, plus additional 1/- Perf 11½ MUH, 1934 Macarthur set MLH, 1935 Anzac set MLH, 1935 Silver Jubilee set MLH, 1936 SA Centenary set MLH (2), 1937 9d NSW Sesqui MUH (2), 1940 AIF set MLH (5), 1963-64 Navigator set to £1 value MUH and many other handy items. Condition varies. Also accumulation of 1,064 MUH low value Pre-Decimal issues from 1932 to 1965. Selection of 111 used Kangaroo, KGV and Pre-Decimal issues from 1913 to 1950 including 1913 2½d Indigo 1st Wmk Kangaroo perf large OS, 1932 6d Chestnut Small Mult and C of A Wmk Kangaroo's O/P OS, 1932 5d Brown C of A Wmk KGV O/P OS, 1914 6d Claret Kooka, 1927 1½d Canberra perf OS (2), 1929 1½d WA Centenary perf OS (2), 1932 1/- Lyrebird O/P OS, 1932 3d Sydney Harbour Bridge O/P OS block of 4, 1932 6d Brown Kooka imprint block of 4, 1935 2/- Silver Jubilee, 1935 1/- Anzac (2), 1937 9d NSW Sesqui block of 4, 1938 Thick Paper Robe set, 1949-50 Arms set (2) and many other handy items. Majority commercially used. Presentable copies with some perf faults. 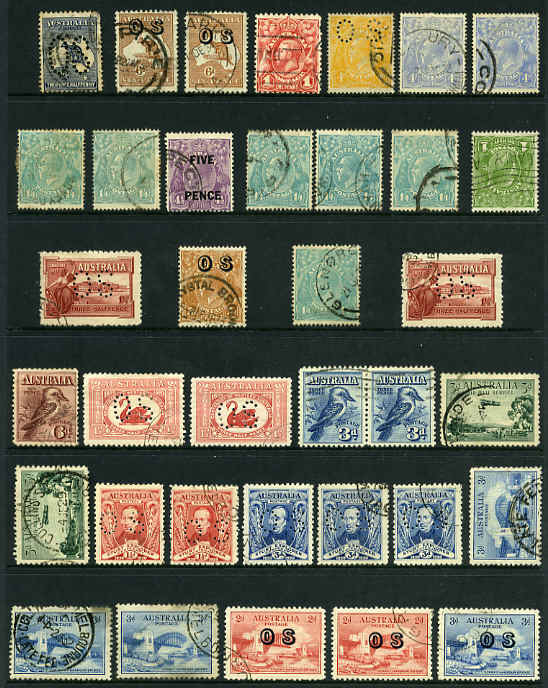 Collection of MUH Pre-Decimal issues in pairs, strips and blocks from 1927 to 1965, all with major listed varieties including many marginal pieces and some duplication. Noted 1927 1½d Canberra top right corner block of 4 (2) with "Flag half-mast" on flagpole at right, 1929 1½d WA Centenary imprint block of 6 with Re-entry to swan's neck and "T" of "Australia", 1931 3d Kingsford Smith pair and Plate No 3 corner block of 6 with "Plane droping mailbag, 1935 3d Silver Jubilee block of 4 with Strong retouch to first "A" of "Australia", plus lower left Plate No 1 and marginal blocks of 4 with Apostrophe between "George" and "V", 1941 2d Mauve KGVI pair (3) with "Medallion" flaw, 1946 2½d Peace "No Watermark", 1960 6d Banded Anteater top right corner blocks of 6 (2) with Retouch to shading around "AUST" State I and II, 1960 8d Brown Tiger Cat lower right corner blocks of 6 with retouch shading right of animal's head State I, II, III and IV ("Typhoon" retouch) MLH, 1965 2/3 Wattle Helecon Paper marginal pair (3) and marginal block of 4 (4) with Oblique line through right side of first "T" of "Wattle" retouched State II, 1965 1/6 Galah marginal pair (6) with Sloping grey line across stump over "RAL", 1965 2/- Whistler marginal pair (11) with Break in vertical branch right of bird and 1965 2/6 Robin marginal block of 4 (8) with Green line under "USTR" of "Australia". Odd minor fault and MLH item. Very high retail value and well worth inspection. 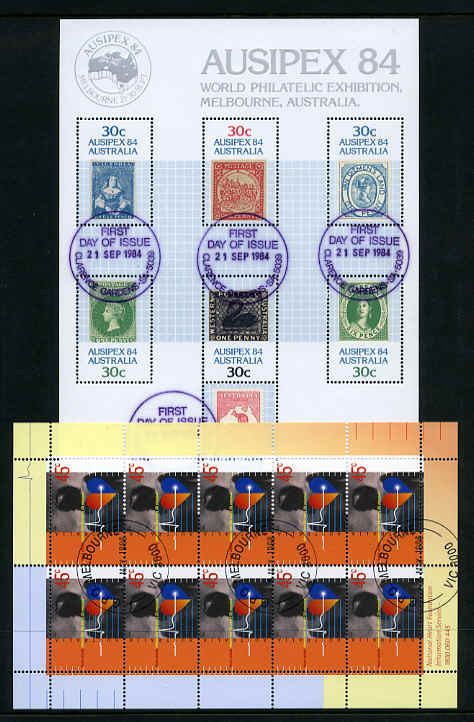 Selection of fine used Pre-Decimal and Decimal stamps including 1927 1½d Canberra perf OS, 1929 3d Airmail Type A and B perf OS, 1929 1½d WA Centenary perf OS, 1931 6d Brown Airmail O/P OS, 1932 1/- Lyrebird O/P OS, 1934 Macarthur set and 1949-50 Arms set. Majority CTO with gum. Odd minor fault. 1927 1½d Canberra sheet of 80, 1929 1½d WA Centenary Plate No 4 sheet of 80. 1949 ½d No Wmk Kangaroo sheet of 160, 1957 7d Flying Doctor sheet of 80, 1959 4d Post Office sheet of 80, 1962 5d Inland Mission sheet of 60 and 1965 5d Churchill sheet of 60 MUH. Post Office and Churhill sheets with faint toning. Also 1959 ½d Die II No Wmk Postage Due sheet of 120 CTO with gum (perf separation between centre horizontal units) and 2 covers franked with KGV issues. Accumulation of 3kg of mostly Decimal Commemorative stamps off paper in 50 gram packets in small carton. 60 packets. 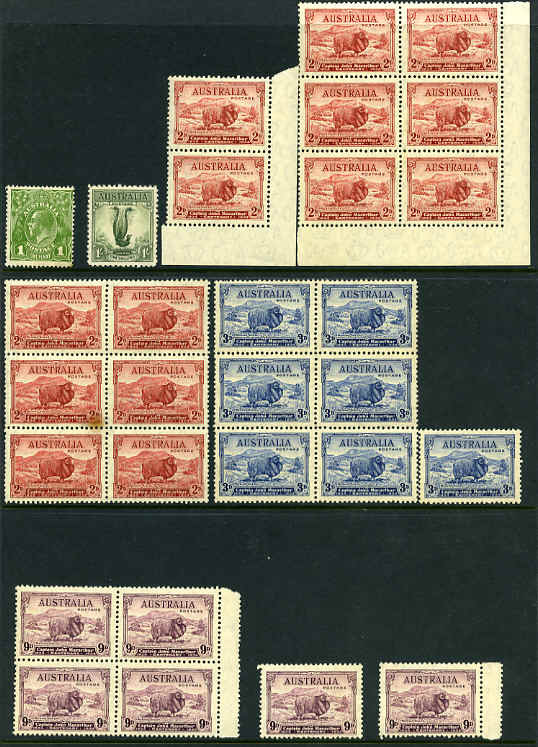 Collection of used Pre-Decimal issues from 1929 to 1965, all with major listed varieties including 1929 1½d WA Centenary (2) with Re-entry to swan's neck and "T" and "TR" of "Australia", 1931 6d Kingsford Smith with Re-entry to "T" of "Australia" etc (2), 1935 2d Silver Jubilee (2) with Vertical scratches by right frame and Retouch to six lines of shading in sky at top right, 1937 2d NSW Sesqui with "Pantaloon" flaw on officer at left retouched State I, 1941 2d Mauve KGVI with "Medallion" flaw (2), 1946 2½d Peace "No Watermark", 1954 3½d Royal Visit with Re-entry in "Royal Visit", "3½d" etc (8), 1959 2/3 Wattle with Oblique line through right side of first "T" of "Wattle" retouched State II (3), 1960 8d Brown Tiger Cat with retouch shading right of animal's head State I and III (State III perf GNSW), 1965 2/3 Wattle with Oblique line through right side of first "T" of "Wattle" retouched State II (5), 1965 1/6 Galah with Retouch under "U" of "Australia" (4), 1965 2/- Whistler with Break in vertical branch right of bird (5) and many more. Mainly fine used with odd minor fault. Very high retail value. Accumulation of 7,468 MUH low value Pre-Decimal issues from 1943 to 1956 in sheets. Noted 1947 1d Slate-Purple Princess Elizabeth "Flush Perf" sheet of 160, plus range of listed varieties. Few with minor creasing. Accumulation of over 1,500 used higher value Pre-Decimal stamps to 10/- from 1941 to 1963. Generally good to fine used with some heavy duplication. Accumulation of 57,800 used Decimal commemorative and Christmas stamps from 1966 to 1998 in bundles of 50, combined into packets of 500 with good variety. Accumulation of over 500 used Pre-Decimal stamps from 1953 to 1965 including a range of 2/- and 2/3 commemoratives and other useful issues. Generally good to fine used with duplication. Very high catalogue value. Selection of MUH Pre-Decimal stamps from 1949 to 1965 including 1957 2/6 No Wmk Aborigine (5), 1959-64 Flower set of 6 (4), 1961 5/- Cream Paper Cattle (3) 1964 7/6 (4), 10/- (4) and £1 Navigators, 1964-65 Bird set of 8 (4), 1965 2/3 Anzac (10) and 1965 2/3 ICY (5). Centering varies. Collection of used Pre-Decimal and Decimal stamps from 1913 to 1978 in Seven Seas Junior album in 2 binders. Noted 1914 6d Claret Kooka (CTO), 1928 3d Kooka M/S (MLH with light crease), 1931 2d and 3d Kingsford Smith O/P OS (CTO), 1932 1/- Lyrebird O/P OS, 1932 5/- Sydney Harbour Bridge (FU with few bluntish perfs), 1935 1/- Anzac, 1935 Silver Jubilee set, 1938 Thick Paper Robe set, 1946 BCOF set, 1949-50 Arms set, 1963-64 Navigator set, 1971 Christmas block of 25 (CTO) and many other handy issues. Mainly good to fine used with odd fault. Collection of MUH Decimal issues from 1966 to 2000 including 1971 Christmas block of 25 in Seven Seas Hingeless album in 2 binders. Few early issues lightly hinged. Face Value $748.00. Complete MUH Decimal collection from 1966 QEII set to 1980 Aircraft set in Lindner Hingeless album with slipcase. 1971 Christmas block of 25 lightly hinged on 2 units. 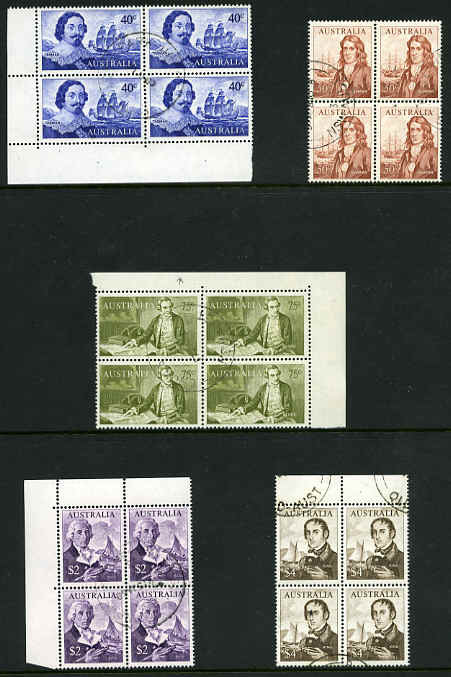 Comprehensive Decimal collection of MUH, MLH and FU stamps from 1966 to 1979 in singles, strips and blocks including many listed varieties, paper variations and better items in 3 loose leaf albums. Noted 1966 1¢ QEII Plate No 4 top right corner block of 4, 1966 4¢ QEII range of Plate No blocks of 4 and 20 including lower Plate No 17 block of 4, 1966 4¢ QEII Helecon Ink and Helecon Paper booklet pane sets of 6 slogans, 1966 Navigator set O/P Specimen, 1967-68 5¢ Thornbill and 5¢ QEII Defence Forces booklets, 1971 Christmas Cream Paper (2) and White Paper blocks of 25, 1974 10¢ Plate No 1 to 8 set and 35¢ Plate No's 2, 3 and 4 Christmas unfolded gutter blocks of 4 and numerous other handy items and sets. Majority are in marginal pieces and lighty hinged on the selvedge only. Well worth inspection. Face Value $1,385.00. Accumulation of 850 used Pictorial Definitives from 1966 to 1976 including 1966 24¢ Kingfisher (52), 30¢ Ibis (100), 1966 75¢ Cook (50), 1969 15¢ Timber (20), 25¢ Wool (50), 1974 75¢ Glider (50) and many more. Mainly good to very fine used. Some faults. Accumulation of approximately 1,000 used Decimal commemorative issues from 1976 to 2003, comprising 500 higher values and 500 various 49¢ stamps. Mainly fine used with good variety. 1989 $1.10 Golf (104), 1990 $1.20 Hang Gliding and 1993 $1.20 Cockatoo (343), 1994 $1.35 Emu (32) and 2003 $1.45 Orchid (17) Pictorial Definitives good to fine used. Odd fault. Accumulation of 2,000 very fine used recent commemorative stamps off paper in small box. 2006 50¢ 50 Years of Television Peel and Stick set in bundles of 100 good to fine used. (5,000 sets). Accumulation of 1,000 used $1.00 and $2.00 Pictorial high value definitive stamps good to fine used on piece from 1974 to 2004. Varying quantities with some heavy duplication. Collection of mint and used stamps from 1913 to 1968 including many sets and handy items, plus useful range of used Australian States issues on album leaves. Noted 1914 6d Claret Kooka GU, 1915 5d Chestnut Single Wmk KGV MLH (2), 1931 6d Brown Airmail MLH, 1934 9d Macarthur MLH, 1934 1/6 No Wmk Hermes MLH, 1935 2/- Silver Jubilee MLH, 1938 Thick Paper Robe set FU, 1949-50 Arms set FU, 1963-64 Navigator sets MLH (£2 value MUH) and FU and many other useful issues. Generally fine condition. Collection of mint and used stamps from 1913 to 1979 in Seven Seas Hingeless album in 2 binders. 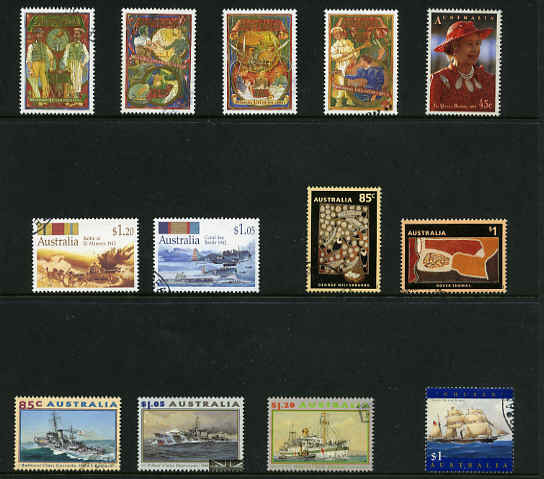 Includes handy range of Kangaroo's, KGV and Pre-Decimal items including 1914 6d Claret Kooka MLH, 1928 3d Kooka M/S MLH, 1963-64 Navigator set MUH and complete MUH Decimal collection from 1966 QEII set to 1979 Fishing set including 1971 Christmas block of 25. Condition varies on earlier issues. Collection of MUH, MLH and used KGV, Pre-Decimal and Decimal stamps from 1913 to 1978 including handy items and some duplication in Lighthouse stockbook. 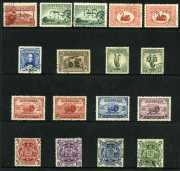 Comprehensive collection of used Pre-Decimal and Decimal issues from 1914 to 1977 including 1914 6d Claret Kooka, 1928 3d Kooka pair from M/S (2, both with Red Exhibition cancellation), 1931 6d Brown Airmail, 1931 6d Brown Airmail O/P OS, 1932 1/- Lyrebird O/P OS, 1932 5/- Green Sydney Harbour Bridge (CTO), 1932 2d and 3d Sydney Bridge O/P OS, 1934 1/- Perf 10½ and 11½ Vic Centenary sets, 1934 Macarthur set (2), 1935 Anzac set, 1935 2/- Silver Jubilee (2), 1936 SA Centenary set, 1937 NSW Sesqui set, 1938 10/- (8) and £1 (5) Thick Paper and 1949 £1 Thin Paper Robes, 1940 AIF set, 1949-50 Arms set (2) and 1963-64 Navigator set of 8. Generally good to fine used condition with some minor faults. High retail value. Collection of mint and used stamps from 1927 to 1978 including largely complete MUH Decimal issues in Seven Seas Standard album. Noted 1971 Christmas block of 25. Some early items with faults. 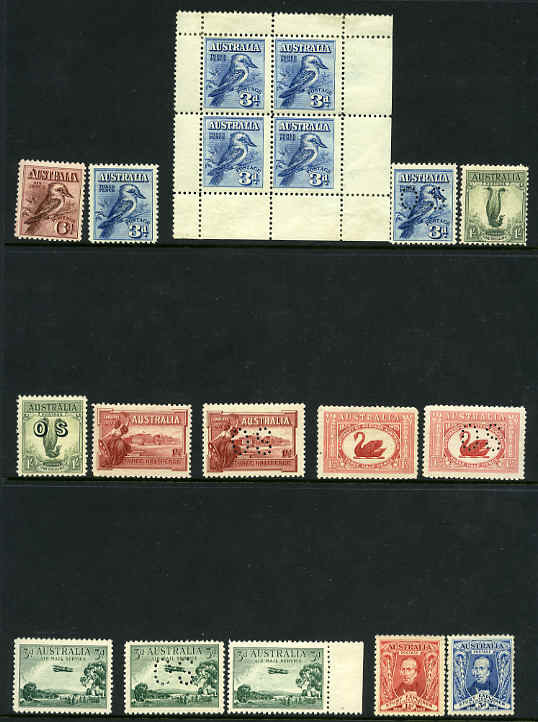 Collection of 885 mint Pre-Decimal stamps from 1929 to 1962 in singles, pairs and blocks comprising mainly of imprints and Plate No's in Lighthouse stockbook. Noted 1929 3d Sturt Plate No's 1 and 2 corner blocks of 4, 1932 3d Sydney Harbour Bridge Plate No 4 corner block of 4, 1935-45 2/- Die II and Redrawn Die C of A Wmk Kangaroo imprint blocks of 4, 1936 Cable set in imprint blocks of 4 and 3d Plate No 1 upper right corner block of 4, 1953 Food set in blocks of 9 (2) and other handy issues. Many blocks lightly hinged on top units, otherwise mainly MUH. Some duplication. 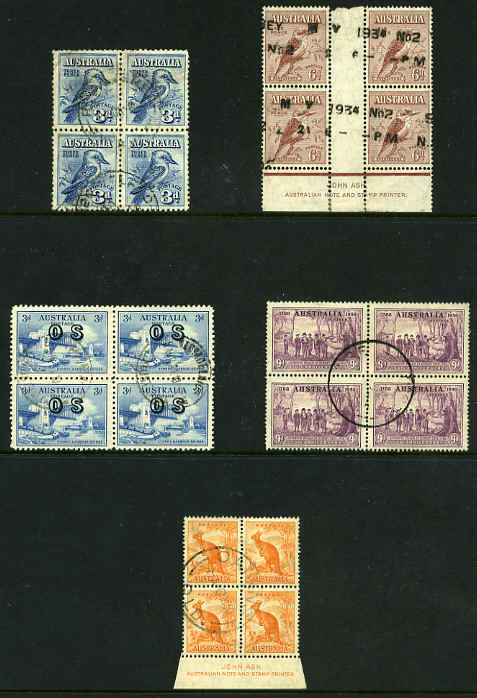 Collection of mint Pre-Decimal imprint pairs, strips and blocks and Plate No blocks from 1929 to 1962 including 1931 6d Airmail and 6d Airmail O/P OS imprint strips of 3, 1932 6d Kooka imprint block of 4, 1932 1/- Lyrebird imprint pair (2), 1932 3d Sydney Harbour Bridge Plate No's 1 to 4 corner blocks of 4, 1934 Perf 10½ and 11½ Vic Centenary sets in imprint blocks of 4, 1934 2d Dark Hills Macarthur imprint block of 4, 1934 1/6 No Wmk Hermes imprint block of 4, 1935 1/- Anzac imprint pair, 1936 SA Centenary set in imprint blocks of 4 (1/- without gum), 1937 NSW Sesqui set in imprint blocks of 4, plus 9d imprint pair, 1937 6d Perf 13½ Kooka imprint block of 4, 1938 3d Die II Thick and Thin Paper KGVI imprint blocks of 4, 1938 10/- Thick Paper Robe imprint block of 4, 1940 AIF set in imprint blocks of 4, 1949 10/- Arms imprint block of 4 and other handy issues. Most blocks hinged on top units only, otherwise MUH. Odd item with toning with some minor faults and short perfs. Accumulation of 5,260 MUH low value Pre-Decimal issues from 1937 to 1959 in singles, blocks and part sheets including many duplicates. Noted 1951 3d Scarlet KGVI booklet part sheet of 63 with horizontal gutter between every third row of stamps (2). Accumulation of used Pre-Decimal stamps on and off paper, sorted into envelopes in shoebox. Noted Australia 1935 £1 Grey C of A Wmk Kangaroo with Telegraph Puncture (2). Accumulation of 6,485 MUH low value Pre-Decimal issues from 1945 to 1965 in singles, blocks, part sheets and sheets including many duplicates. 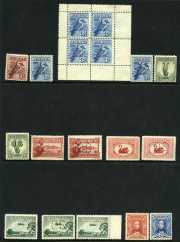 Noted 1951 3d Scarlet KGVI booklet sheet of 144 with horizontal gutter between every third row of stamps. Odd minor fault. Accumulation of 2,426 good to fine used stamps from 1966 to 2001 including 1973 $1.00 Navigator scarce perf 14¾ (6), 1967 25¢ Christmas (27), 1968 20¢ Weather Watch (13), 1968 25¢ Intelsat (19), 1968 25¢ Mexico Games (23), 1969 Primary Ind set (20), 1969 25¢ Christmas (18), 1970 30¢ Royal Visit (17), 1970 30¢ Cook (33), 1970 30¢ Qantas (41), 1972 Primary Ind set (29), 1972 35¢ Munich Olympics (34), 1972 35¢ Christmas (25), 1973 National Dev set (24), 1973 30¢ Christmas (36) and numerous modern higher value commemorative issues to $5.00. High retail value. Accumulation of stamps from 1973 to 2000 CTO with gum, mainly on FDI at Adelaide GPO with strength in 1980's period including many sets in singles and blocks of 4, plus some miniature sheets and a few Australian Antarctic Territory. Face Value $480.00. Accumulation of many thousands of used Pre-Decimal and Decimal stamps off paper, sorted into various size bundles. Good range of commemorative issues. Accumulation of many hundreds of mostly Decimal used stamps, plus collection of full CDS postmarks on paper in Prinz stockbook. Accumulation of many hundreds of used stamps including useful range of Pre-Decimal issues in Hagner binder and Lighthouse stockbook. Also range of FDC's and miscellaneous items including USA 1983 Space Shuttle Flight cover. Collection of MUH Pre-Decimal issues from 1913 to 1965 including useful items and a range of Kangaroo and KGV issues in Seven Seas Hingeless album. Some issues MLH. Accumulation of thousands of used Pre-Decimal and Decimal stamps from 1913 to 1988 including some handy items in 2 stockbooks and 4 binders containing 134 Hagner sheets, plus in various size bundles in small box. Also small range of Foreign miniature sheets MUH. 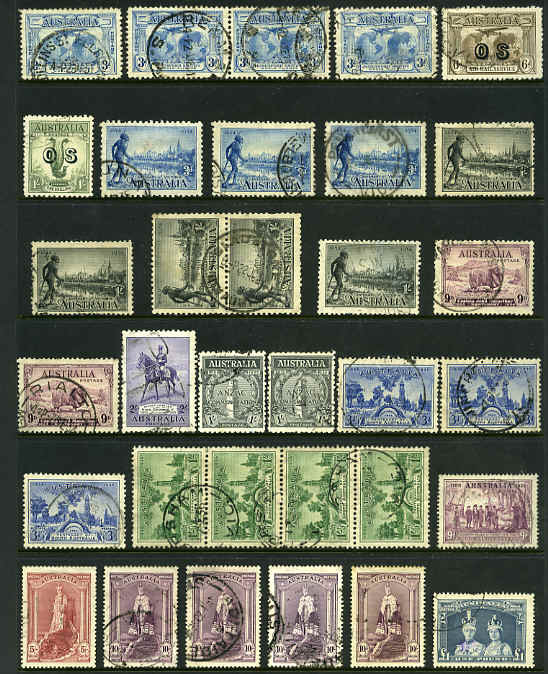 Collection of mint and used Pre-Decimal issues from 1913 to 1965 in Seven Seas Hingeless Album. Includes complete KGV collection of 72 stamps including all watermark, Die variations and OS overprints good to fine used and handy range of Pre-Decimal issues. Odd fault. Collection of many hundreds of mainly used Kangaroo, KGV, Pre-Decimal and Decimal stamps from 1913 to 1981 including numerous handy items and some duplication in Seven Seas Hingeless album and 3 loose leaf albums, plus bundle of covers, FDC'c and miscellaneous items in small box. Noted 1931 4½d Violet Die II Small Mult Wmk perf 13½ KGV CTO with gum, 1932 5d Brown C of A Wmk KGV O/P OS CTO with gum, 1914 6d Claret Kooka part imprint pair MUH (creased), 1928 3d Kooka M/S MUH (trimmed selvedge), 1931 2d and 3d Kingsford Smith O/P OS CTO, 1931 6d Brown Airmail block of 4 CTO, 1932 1/- Lyrebird MLH, 1932 1/- Lyrebird O/P OS MUH, 1932 5/- Green Sydney Harbour Bridge commercially used, 1932 2d and 3d Sydney Harbour Bridge O/P OS blocks of 4 MUH/MLH, 1934 1/- Perf 10½ and 11½ Vic Centenary MLH, 1934 9d Macarthur MUH, 1935 1/- Anzac MLH, 1935 Silver Jubilee set MLH and GU, 1936 1/- SA Centenary MUH, 1948-49 Thin Paper Robes set MLH, 1940 6d AIF MUH (2), 1949-50 Arms set FU (2), 1950 £2 Arms MUH (creased), 1953 Food blocks of 9 set MLH, 1963-64 Navigator set FU, 1973 $1.00 Navigator scarce perf 14¾ MUH, 1971 Christmas Cream Paper block of 25 MUH and many more handy issues. Condition varies, but well worth inspection. Collection of 281 different mint Pre-Decimal issues from 1914 to 1965 including 1914 6d Claret Kooka, 1927 1½d Canberra, 1928 3d Kooka, 1929 3d Airmail Type A, 1929 1½d WA Centenary and 1930 Sturt set perforated OS, 1928 3d Kooka M/S (Thinned), 1929 3d Airmail Type A and B, 1931 6d Airmail O/P OS, 1932 1/- Lyrebird, 1932 1/- Lyrebird O/P OS (MUH), 1934 Perf 10½ and 11½ Vic Centernary sets, 1934 Macarthur set, 1934 1/6 No Wmk Hermes, 1935 Anzac set, 1935 Silver Jubilee set, 1936 SA Centenary set, 1937 NSW Sesqui set, 1937-40 3d Blue Die I, Die II Thin Paper and Die III KGVI, 1940 AIF set, 1946 BCOF set, 1961 5/- Cream Paper Cattle and 1963-64 Navigator set (£2 MUH). Generally fine condition with some minor faults. Collection of good to fine used stamps from 1913 to 1986 in Seven Seas Hingeless album in 2 binders. 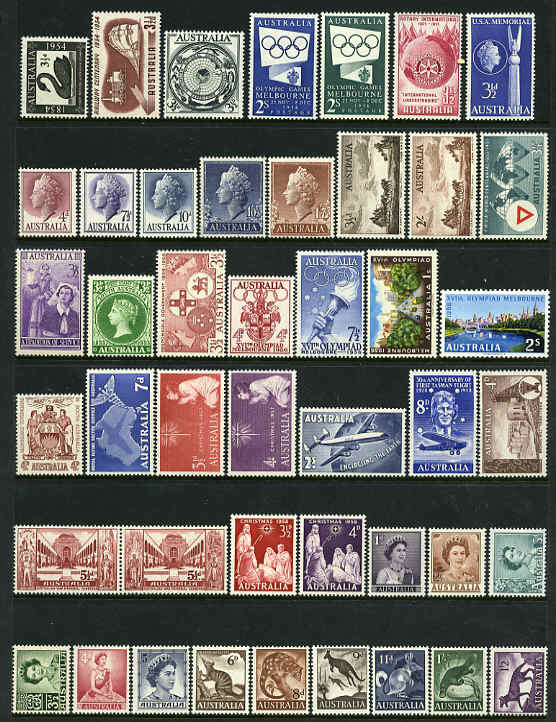 Noted handy selection of KGV issues to 1/4 including 1930 4½d Die II Small Mult Wmk perf 13½ CTO with gum, 1931 6d Brown Airmail CTO with gum, 1932 1/- Lyrebird O/P OS FU, plus a good range of other Pre-Decimal issues and largely complete Decimal collection excluding 1968 Soil and Medical gutter pair and 1971 Christmas block of 25 only. 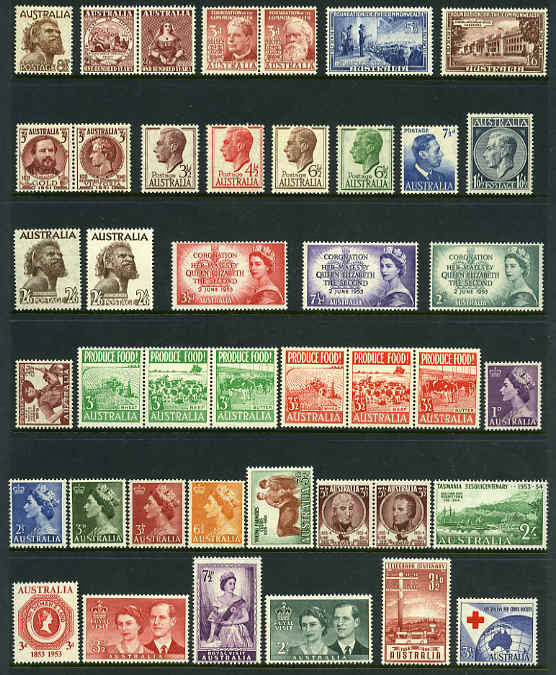 Collection of good to fine used stamps from 1913 to 1965 in Seven Seas Hingeless album. Noted handy selection of Kangaroo and KGV issues mainly perf OS including 10/- C of A Wmk Kangaroo O/P Specimen mint without gum, 1914 6d Claret Kooka, 1927-30 1½d Canberra, 3d Kooka, 3d Airmail Type A and B, 1½d WA Centenary (2) and Sturt set (2) perf OS CTO, 1931 6d Brown Airmail O/P OS, 1932 1/- Lyrebird O/P OS, 1938 Thick Paper Robe set, 1948 10/- Thin Paper Robe, 1949-50 Arms set and other handy issues. Odd fault. 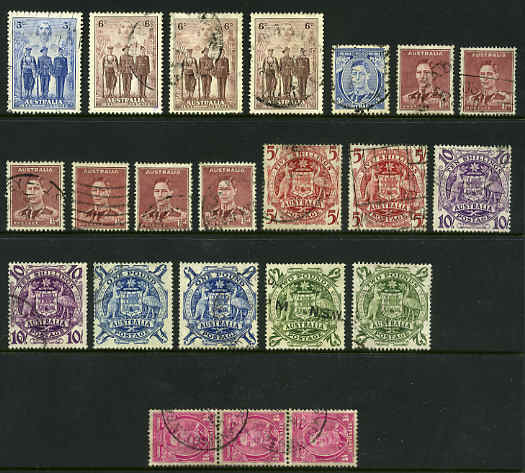 Collection of used Pre-Decimal stamps from 1914 to 1965 including 1914 6d Claret Kooka (CTO), 1928 3d Kooka M/S (MLH with light crease), 1931 2d and 3d Kingsford Smith O/P OS (CTO), 1931 6d Brown Airmail O/P OS (CTO), 1932 1/- Lyrebird O/P OS (CTO), 1932 5/- Sydney Harbour Bridge (CTO), 1934 9d Macarthur (CTO), 1935 1/- Anzac (CTO), 1935 2/- Silver Jubilee (CTO), 1938 Thick Paper Robe set, 1946 BCOF set (MLH), 1949-50 Arms set and 1963-64 Navigator set in Seven Seas Standard album. Odd fault. 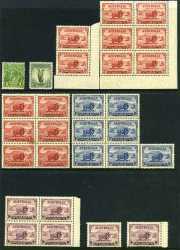 Small selection of mint Pre-Decimal stamps including 1932 1/- Green Lyrebird, 1934 9d Macarthur (6), 1935 2/- Silver Jubilee (2 MUH and 1 MLH), 1936 2d Cable lower right Plate No 4 blocks of 4 (4) and 1936 3d Blue Cable MUH (10). Some faults. 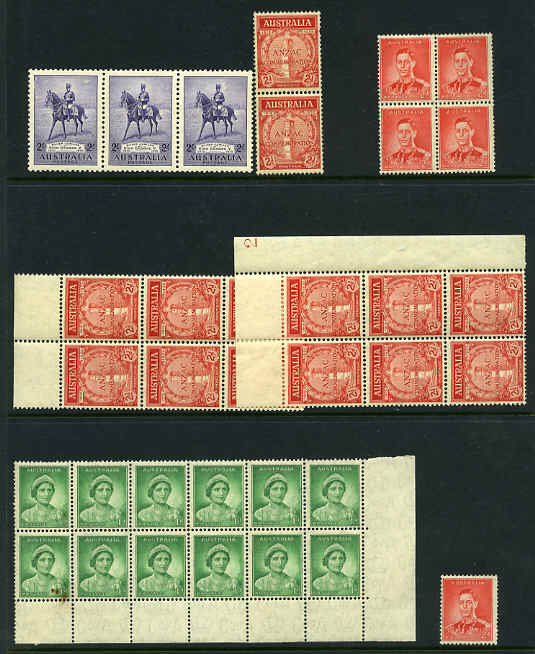 Collection of used Pre-Decimal stamps from 1913 to 1965 in Stanley Gibbons Standard album. Noted 1914 6d Claret Kooka, 1932 1/- Lyrebird O/P OS, 1932 5/- Sydney Harbour Bridge (CTO), 1935 1/- Anzac (CTO), 1935 Silver Jubilee set, 1938 Thick Paper Robe set, 1949-50 Arms set and 1963-64 Navigator set and other handy issues. Mainly good to fine used with odd fault. Accumulation of thousands of used Pre-Decimal and Decimal stamps from 1927 to 1987 including a handy range of KGV issues and better items in 5 quality stockbooks, plus sorted into packets and in small box. Accumulation of 1,475 low value MUH Pre-Decimal stamps from 1927 to 1965, plus 140 mint imprint blocks of 4 including many duplicates. Accumulation of 382 mint Pre-Decimal issues from 1927 to 1956 in singles, pairs and blocks, mixed MUH and MLH in Hagner album. 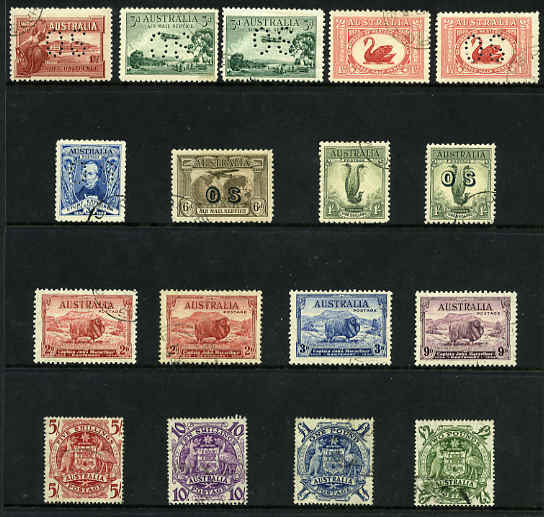 Includes 1927 1½d Canberra corner block of 8 with Flaw in top of first "A" of "Australia" variety (MUH), 1928 3d Kooka corner block of 12 (MUH), 1929 3d Airmail Type B (5), 1930 3d Sturt (12), 1931 6d Kingsford Smith (4), 1931 6d Airmail O/P OS, 1932 1/- Lyrebird O/P OS pair (MUH), 1934 Perf 10½ Vic Centenary set, 1936 3d Cable (9), 1936 SA Centenary set (5, including imprint blocks of 4), 1937 NSW Sesqui set, 1937 6d Perf 13½ Kooka Ash imprint block of 4, 1938 1½d Brown perf 13½ KGVI (28), 1940 3d Blue Die III KGVI (6), 1940 3d AIF (5), 1948 10/- Thin Paper Robe, 1961 5/- Cream Paper Cattle (4) and many more handy items. Some minor faults, but mainly fine. Accumulation of 3,200 low value MUH Pre-Decimal stamps from 1927 to 1965 including many duplicates. Accumulation of 770 mint Pre-Decimal issues from 1927 to 1956 in singles, pairs and blocks, mixed MUH and MLH in Posthorn stockbook. Includes 1928 3d Kooka M/S (Faults), 1929 3d Airmail Type A imprint block of 4 and Type B block of 4, 1932 3d Sydney Bridge Plate No set of 4 corner blocks of 4, 1934 3d Vic Centenary (15), 1934 2d Dark Hills and 3d Macarthur blocks of 4, 1935 1/- Anzac imprint pair (MUH), 1935 3d Silver Jubilee (8), 1937 NSW Sesqui set in imprint blocks of 4, 1938 Thick Paper Robe set in imprint pairs and 1948 10/- Thin Paper Robe pair (MLH), 1940 AIF set (6), 1942 2½d KGVI booklet and many more handy items. Some faults, but mainly fine. Collection of MUH Pre-Decimal issues from 1932 to 1965 in Seven Seas Hingeless album. Includes 1932 2d and 3d Sydney Bridge O/P OS, 1937 NSW Sesqui set and largely complete from 1949-50 Arms set onwards including 1963-64 Navigator set of 8. Mixed centering. High retail value. Accumulation of 426 mint and MUH Pre-Decimal stamps from 1945 to 1965 in small stockbook. Mostly lower values with some duplication and faults. Collection of good to fine used Pre-Decimal stamps including few handy items in Lighthouse stockbook. Collection of MUH Decimal issues from 1966 to 1973 in postional singles, pairs, strips and blocks, all with major listed varieties including some duplication. Noted 1972 35¢ Munich Games gutter block of 6 (2) with Retouch to "M" of "Munich" and "19" of "1972" and Retouch to "M" of "Munich" and "1" of "1972" and 1972 35¢ Christmas block of 4 (2) with nick in frame at lower left and Pale area at top left corner and gutter block of 8 with Weak "L" of "Lance" in imprint, Weak "C" in "Christmas" and "Christ" and Two retouches over bird's head varieties. (401 stamps). Centering varies. Catalogue Value $1,606.00. Largely complete fine used Decimal collection from 1966 to 1984, plus range of fine used Australian Antarctic Territory and Cocos (Keeling) Islands issues in loose leaf album. Noted AAT 1966 Definitive set. Accumulation of thousands of mainly modern stamps off paper in shoebox including some high values and some New Zealand. Accumulation of 2,680 mostly MUH Pre-Decimal low value stamps in singles, blocks and sheets, stored in mint sheet file and stockbook. Odd MLH and a few higher values. Also selection of MUH Pacific Islands issues on stockcards and a few foreign used stamps. Accumulation of 5,724 MUH low value Pre-Decimal stamps in full and half sheets. Few sheets hinged on selvedge and the odd minor fault. Collection of mostly fine used stamps from 1966 to 2003 in 3 volume Seven Seas Standard album with slip cases, largely complete for most years. Accumulation of tens of thousands of mostly earlier used Decimal stamps in packets and bundles. Noted 1966 $2.00 Navigator FU (46) , 1970 20¢ Expo CTO (89), 1970 30¢ Royal Visit VFU (96), 1970 30¢ Cook VFU (94) and 1970 30¢ Qantas CTO (90). Collection of used Decimal stamps from 1966 to 1996 in large Chinese stockbook, plus a range of mint and cancelled FDI PSE's from 1978 to 1985, few Pre-Decimal FDC's and 1988 Links Bicentennial Heritage books set. Also New Zealand 1986 Post Office Year book. Largely complete collection of good to fine used Decimal stamps from 1966 QEII set to 1979 Fishing set including 1970 Cook Anpex M/S (MUH) and 1971 Christmas block of 7 in Seven Seas Hingeless album. Largely complete MUH Decimal collection from 1966 QEII set to 1983 Explorers set, plus range of MUH, MLH and FU Pre-Decimal issues in Seven Seas Hingeless album. Excludes 1966 Bird set, 1966 Navigator set and 1971 Christmas block of 25 only. Face value of Decimal issues $144.00. Accumulation of many thousands of used Decimal stamps crammed into shoebox. 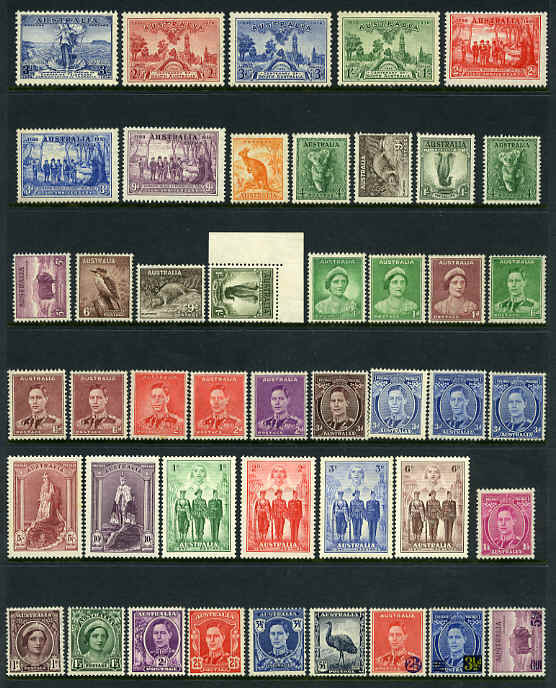 Comprehensive collection of good to fine used Decimal stamps from 1966 to 2007 including many higher value commemorative issues, numerous sets and small range of MUH in 2 quality stockbooks. Many recent issues CTO with gum. Collection of good to fine used Decimal stamps from 1966 to 2007 including many higher value commemorative issues, numerous sets and small range of MUH in Lighthouse stockbook. Accumulation of 41,700 good to fine used Commemorative Peel and Stick stamps in bundles of 100 including 2003 50¢ Blooms set (100 sets), 2004 50¢ Railways set (100 sets), 2005 Native Trees set (100 sets), 2006 50¢ Lighthouses set (100 sets), 2006 50¢ Postie Kate set (100 sets), 2006 50¢ Driving through the Years (300 sets), 2006 50¢ Dangerous Australians (800 sets), 2006 50¢ 50 Years of Television (2,300 sets), 2007 50¢ Legends of Australian Horse Racing set (500 sets), 2007 50¢ Signs of the Zodiac set (200 sets), 2007 50¢ Under the Big Top set (500 sets), 2007 50¢ Big Things set (400 sets), 2007 50¢ Market Feast set (300 sets), 2007 50¢ Australian Botanic Gardens set (1,100 sets) and 2007 50¢ 50 Years in Space set (400 sets). Also 2,250 modern sheet stamps good to fine used in bundles of 50 or 100. Accumulation of thousands of mostly modern used stamps off paper in shoebox. Accumulation of many thousands of mostly used Pre-Decimal and Decimal stamps in 4 Lighthouse stockbooks and shoebox including some useful issues, Australian States and Perfins. Also brand new 64 page Lighthouse stockbook and on paper mixture in small box. Accumulation of 3,800 MUH low value Pre-Decimal stamps from 1927 to 1965 in singles and blocks including numerous duplicates. Collection of mint and used Pre-Decimal and Decimal stamps from 1927 to 1970 including small range of KGV issues in 2 loose leaf albums. Noted 1928 3d Kooka perf OS CTO, 1934 Macarthur set mint, 1935 Anzac set mint 1935 Silver Jubilee sets mint and FU, 1936 SA Centenary set mint, 1937 NSW Sesqui set mint, 1937 3d Blue Die I White Wattles KGVI FU, 1940 AIF set mint and many more handy items, plus small selection of covers and some Foreign stamps. 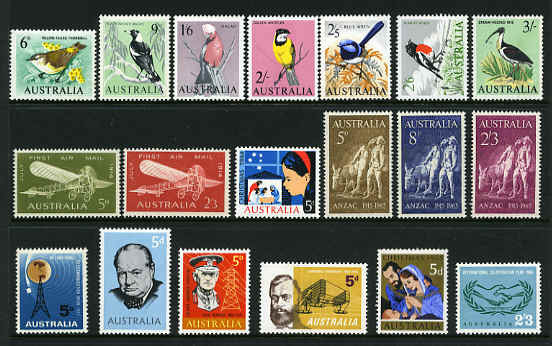 Extensive collection of mint and used stamps in 2 loose leaf albums including a good range of Kangaroo issues with 2nd Wmk set FU, values to 10/-, as well as some imprint blocks or pairs and some varieties, a handy selection of KGV issues, mostly in imprint blocks or pairs, 1914 6d Claret Kookaburra (1 MLH, 2 FU), 1929 3d Green Air Mail imprint block of 4 and pair MLH, 1929 1½d W.A. Centenary complete set of Plate no 1 to 12 blocks of 4 MLH, 1930 1½d Sturt complete set of Plate No 1-8 blocks of 4 MLH, 1930 3d Sturt block of 8, imprint block and Plate No 1 and 2 blocks of 4 MLH, 1931 2d Kingsford Smith complete set of Plate No 1 to 8 blocks of 4 MLH, 3d Kingsford Smith Plate No 1 to 3 blocks of 4 MLH, 6d Kingsford Smith imprint block of 8 with re-entry MLH, 1931 6d Brown Air Mail block of 4 MLH, 1932 6d Brown Kooka block of 4 and imprint block of 4 MLH, 1932 1/- Green Lyrebird imprint pair MLH, 1/- Lyrebird O/P OS pair MLH, 1932 3d Sydney Harbour Bridge block of 4, imprint block of 4 and Plate No 1 to 4 blocks of 4 MLH, 1934 1/6 No Wmk Hermes MLH, 1935 1/- Anzac Plate no 1 pair MLH on selvedge only, a good range of 1935 2d Silver Jubilee Plate No blocks of 4 MLH, 1935 3d Silver Jubilee lower right Plate No 1 block of 20 with imprint mostly MUH, 1936 3d Cable imprint blocks of 4 MLH (3), 1936 S.A. Centenary set in MLH imprint blocks of 4, 1937-38 3d Blue Die II KGVI Thick paper imprint blocks of 4 (2) and Thin paper (1) MLH, 1937 NSW Sesqui set in MLH imprint blocks of 4, 1938 5/- and 10/- Thick paper Robes imprint blocks of 4 MLH, 1938 £1 Robes Thick paper block of 4 FU, 1938-49 5/- Robes Thin paper imprint block of 4 and block of 12 mostly MUH, 1940 3d Blue AIF block of 15, AIF set in imprint blocks of 4 mostly MUH, and numerous other imprint blocks of 4. Odd fault, but generally fine condition. Many blocks are only hinged on one or 2 units. Inspection will reward. Accumulation of 99,400 KGVI and QEII era Pre-Decimal Definitive stamps in bundles of 50 and 100, including 5,800 Christmas or commemorative issues. Some heavy duplication. Collection of mint Decimal issues from 1966 to 1986 in Seven Seas Hingeless album. Mainly MUH with some faults. Also 1984, 1986 and 1991 Post Office Year albums and 1990 The Colonial collection. Face value $294.00. 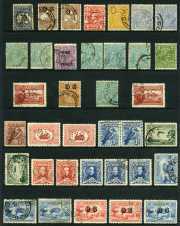 Accumulation of approximately 61,000 Pre-Decimal and Decimal stamps from 1938 to 1978, mainly in bundles of 100 with main strength in Decimal period including numerous Commemorative issues. Also accumulation of thousands of mainly Decimmal issues off paper in shoebox. Accumulation of many thousands of used stamps from early to modern with main strength in Decimal issues in 6 quality stockbooks including range of handy issues and numerous sets. Considerable duplication. Collection of many hundreds of mainly used Pre-Decimal and Decimal stamps in 11 albums or stockbooks including some Foreign content, plus range of covers. Accumulation of thousands of used Decimal stamps sorted into envelopes. Accumulation of many hundreds of mint and used stamps in 5 various sized stockbooks and small boxes including a useful range of MUH sets. Accumulation of many hundreds of used stamps from early to modern in large Chinese stockbook and sorted into envelopes in 2 shoeboxes including some Foreign. Accumulation of many thousands of recent used commemorative stamps off paper in shoebox. Accumulation of 110,200 Decimal Definitive stamps from 1966 to 1990 in bundles of 50 and 100. Good variety with some heavy duplication. Accumulation of many hundreds of used Pre-Decimal and Decimal stamps from 1914 to 1990 in 2 large Lighthouse stockbooks and on 75 Hagner sheets in 2 binders. Includes numerous handy items and a useful range of mint Pre-Decimal issues. Condition varies. Accumulation of thousands of used stamps from 1927 to 1965 including numerous handy items and sets sorted into packets in 3 shoeboxes. Noted 1928-37 3d Blue (150) and 1953-58 2/- (78) Commemoratives. Condition varies. Accumulation of many thousands of used Pre-Decimal and Decimal stamps from 1932 to 1982 sorted into envelopes. Includes odd handy item and some Foreign. 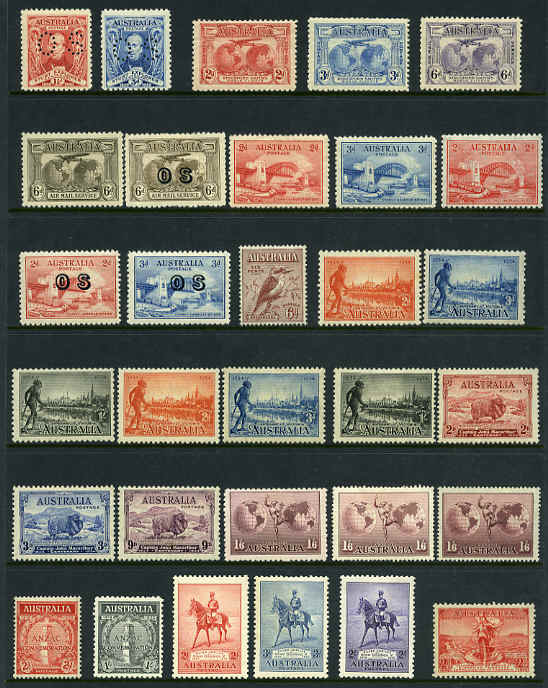 Collection of mostly used Pre-Decimal and Decimal stamps from 1913 to 1981 including Kangaroo and KGV issues, plus range of State stamps on 62 Hagner sheets in 2 binders. Also selection of FDC's, PSE's and miscellaneous items, plus complete MUH Cocos (Keeling) Islands collection from 1969 to 1984. Accumulation of 26 pounds of mainly QEII Pre-Decimal on paper mixture including some Foreign in packets. Mostly Definitive issues. Useful for postmarks. Accumulation of mostly QEII era Pre-Decimal and early Decimal stamps on paper in wine carton. Accumulation 12 pounds of mostly late Pre-Decimal and early Decimal Definitive issues on paper. Possible variety or postmark interest. Collection of mint and used Pre-Decimal and Decimal stamps from 1913 to 1981 in Seven Seas Hingeless Album and 2 stockbooks, 1981 Post Office Year Album, range of POP's in shoebox and some Foreign stamps in loose leaf album and small box. Face value of MUH Decimal issues $182.00. Also bundle of FDC's and PSE's from 1979 to 1984 with a face value of $115.00. 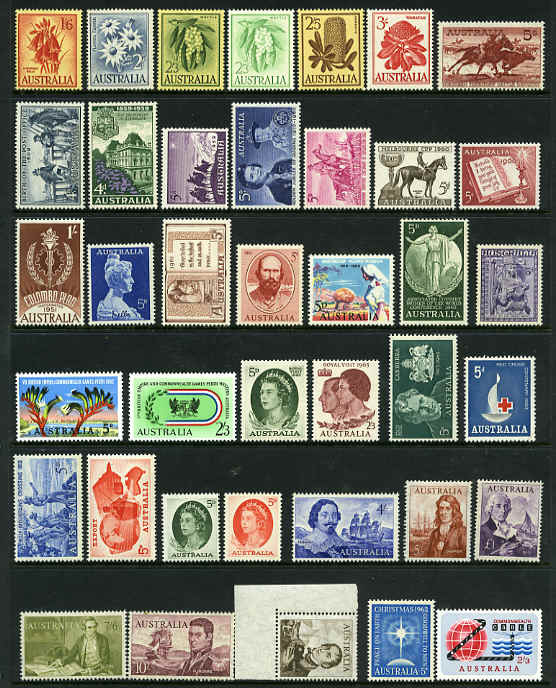 Accumulation of mostly late Pre-Decimal issues on paper in small carton, on and off paper Foreign mixture in shoebox, plus range of MUH and used early Decimal Australian and Papua New Guinea stamps in 2 albums. Accumulation of tens of thousands of used stamps off paper with some Pre-Decimal content. Accumulation of 11 pounds of mainly 1970's and 1980's era on paper mixture with some higher value content and the odd foreign item. Accumulation of 50 pounds of 1990's era commmemorative stamps on paper and sorted into types. Accumulation of 128 pounds of mainly 1990's era Definitive stamps on paper, with some earlier content. Accumulation of 71 pounds of 1990's era commmemorative stamps on paper. Accumulation of 58 pounds of mainly 1970's era stamps on paper, with numerous commemorative issues. Accumulation of many thousands of Pre-Decimal and Decimal stamps on and off paper in 2 shoeboxes and small carton, plus range of Maximum cards and miscellaneous items. Also collection of Foreign stamps from a range of countries in 3 albums. Accumulation of many thousands of used Decimal stamps sorted into packets, plus off paper mixture in shoebox including packet of Foreign. Mainly 1980's and 90's period. Accumulation of tens of thousands of used Pre-Decimal and Decimal stamps off paper from early to modern in wine carton. Weight 12½ pounds. Accumulation of 111,000 Decimal Christmas stamps from 1966 to 2004 in bundles of 100. Heavy duplication. Accumulation of 24 pounds of mainly recent close cut on paper mixture on single paper. Accumulation of 19 pounds of mainly recent on paper mixture. Accumulation of 30 pounds of mostly recent close cut on paper mixture on single paper. Accumulation of 32 pounds of mainly modern on paper mixture including some earlier content, plus small range of Pre-Decimal stamps. Accumulation of 80 pounds of modern on paper mixture, some on large piece. Some Pre-Decimal and earlier Decimal content. Accumulation of 37 pounds of paper mixture on double paper with main strength in 1980's and 1990's period including the odd foreign issue. Accumulation of 18½ pounds of mostly modern on paper mixture, some on large piece. Some high value Commemorative content. Accumulation of 40 pounds of mainly modern close cut on paper mixture on single paper. Accumulation of 34 pounds of mainly recent on paper mixture on single paper. Accumulation of 21 pounds of mainly recent on paper mixture. Accumulation of 13 pounds of on paper mixture, predominately Pre-Decimal stamps and including some Foreign. Accumulation of 37 pounds of recent close cut on paper mixture on single paper. Accumulation of 33 pounds of mostly recent close cut on paper mixture on single paper. Accumulation of 20 pounds of mainly modern on paper mixture. Accumulation of 31 pounds of on paper mixture. Mainly Definitive issues, but some commemorative content. Accumulation of 23 pounds of mainly recent on paper mixture. Accumulation of 34 pounds of mainly modern close cut on paper mixture on single paper. Accumulation of 105 pounds of mainly 1980's and 1990's era stamps on paper, with a higher than normal portion of commemorative issues. Accumulation of 20 pounds of mainly recent close cut on paper mixture on single paper. Accumulation of approximately 35,000 stamps in bundles and sorted into packets including numerous commemoratives and some higher value Definitive issues with some Pre-Decimal content. Accumulation of 35 pounds of mainly modern close cut on paper mixture on single paper including some earlier content. Accumulation of 30 pounds of on paper mixture including some Foreign content. Accumulation of tens of thousands of used Pre-Decimal and Decimal stamps in various size bundles and sorted into packets including many commemoratives. Accumulation of 13 pounds of mainly modern on paper mixture with some foreign and higher value content, plus a small portion of off paper. Accumulation of 28 pounds of on paper mixture. A good portion of recent material, but also includes a range from various earlier Decimal periods.